Strange, but true - not every desk is designed with a computer in mind. I know it’s hard to believe in this day and age, but whatever. And what about those of you using a countertop or table as a computer desk? Sure the computer will fit – the monitor goes behind the keyboard, the CPU goes ... well, the CPU goes wherever the wires allow. You can just pull up a folding chair and start clicking away. But that doesn’t sound very appealing, does it? No ergonomics there. The Metal Art Jr. helps your computer fit into your life. Both in function and in form. 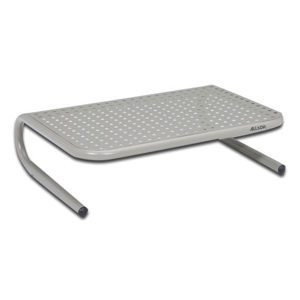 Forged from steel, it provides a sturdy shelf for your monitor or printer. And there’s space beneath for your keyboard, dictionary or old copies of Doom and SimCity. 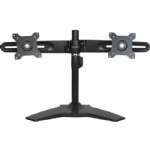 Its compact base makes it perfect for flat panel monitors and even laptops. The simple curved design and powder-coated finish aren’t meant to match your computer. They help create a balance between the comfortable feel of your home or office and the technical convenience of your computer. In a nutshell, the Metal Art Jr. gives your monitor a lift and looks good doing it.